A Genuine Dually Training Halter by Monty Roberts. Each Dually Training Halter comes with fitting instructions and DVD. Monty Roberts Dually Halter is an effective training halter for leading and loading that is also humane, practical and easy for anyone to use. 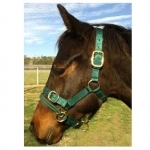 The Dually Halter does NOT use excessive poll pressure therefore reducing any cause for soreness or rearing. The Dually Halter has a unique design with an adjustable double noseband, high quality brass hardware, double stitched nylon and left and right side ring designed especially for schooling. Plus suits most horses for long lining and starting and some horses for riding especially if they haven't been going well in bits previously. 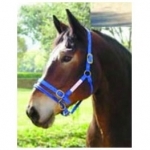 It can be used as a normal headcollar for tying up. Remember you have the Dually Halter on your horse as a training aid (as an alternative to a bridle, a chifney, a lunge cavesson, a flat halter, rope halter with knots or a halter with a chain over the nose). The reason you are using the Dually is because it won’t damage or desensitise your horse’s mouth, it doesn’t dig in anywhere or work on very sensitive areas of the horse’s face, it doesn’t use excessive poll pressure and when fitted correctly it won’t slip around the horse’s face so you gain more accuracy and control of the horse with less compression than most other options. 'Fitted correctly' is the key phrase here. If you don't take the time to fit the dually correctly, then it will not work the way that it is intended. It is best to take a little extra time getting the fit exactly right if you really want the Dually to help give you excellent results with your horse. 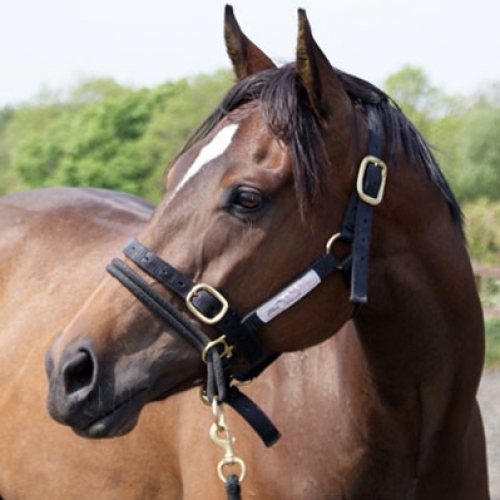 Monty Roberts Dually Halter - Made from the Finest Quality Materials but Affordable!